Genetic counselling is a process that helps individuals and families understand and cope with genetic conditions, and find out about various options, tests, and resources available. The term "genetic condition" is used to describe any medical disorder caused by variation within an individual's hereditary material, such as a change in his or her chromosomes or genes. A genetic counsellor is a health care professional. He or she typically has a Master's degree in genetic counselling with specialized training in medical genetics and counselling. Genetic counsellors usually work in a clinical setting, within public and private health-related institutions, and in conjunction with geneticists and other medical specialists. They act as educational resources for other health care professionals and the general public. 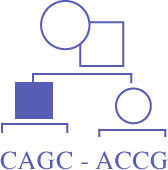 Most genetic counsellors are certifi ed by the Canadian Association of Genetic Counsellors (CAGC) and/or the American Board of Genetic Counseling (ABGC). Why consider genetic counselling for infertility? Approximately one in eight couples experiences infertility, in some cases because of an underlying genetic condition. Genetic counsellors can work with individuals or couples having difficulty achieving or maintaining a pregnancy to investigate possible reasons for their infertility. At present, six percent of all genetic counsellors in North America specialize in infertility. Genetic counsellors are trained to discuss various AHR issues, including the fact that some therapies may increase the risk of having a child with a genetic condition. Genetic counsellors often work closely with fertility counsellors and/or mental health professionals to help individuals and couples deal with the range of emotions associated with infertility and AHR, and to review options for getting pregnant through AHR. Typically, during the first visit with a genetic counsellor, information such as personal and family medical history is collected. This information is kept confidential and is used to identify individuals who may be at risk for an occurrence (or recurrence) of a particular genetic condition, and to determine eligibility for specific genetic tests and screens that may reveal the cause of underlying fertility issues. The counsellor explains the various genetic testing and screening options in a way that promotes informed choice. They may also provide information about heredity and specific genetic conditions, including what the disorder is, the probable cause of the condition, how it is inherited, and how it can be detected and managed. It is important to realize that underlying genetic conditions are responsible for only a small percentage of infertility cases, and that genetic tests and screens have their limitations. Genetic counselling may not always uncover a reason for the infertility. Genetic counsellors also help patients cope with difficult situations, such as contemplating genetic testing or screening, prenatal decision-making, living with a genetic condition, caring for someone who has a genetic condition, and being at risk for a genetic condition. They are also patient advocates and can often help patients make connections to support services in their community. How can I make an appointment with a Genetic Counsellor? Individuals or families seeking genetic counselling are usually referred to a medical genetics clinic by a health care professional (such as a family doctor). In Canada, genetic counselling is part of the health care system and there is no additional cost to use the service in a non-private clinical setting. To find a medical genetics clinic in your area, please visit our home page and click on Genetics Clinic.